If you are missing one tooth or several teeth, you have a few options for replacement. These options include dental implants, a fixed bridge, a removable partial, or a denture if all teeth are missing. Today we are going to talk about Dental Implants and how once they are placed, we restore them at Clemson Dental Associates. Dental implants replace the root of a tooth that is no longer present. They create strong foundation for a fixed or removable tooth. There are many reasons Dr. Martin may suggest for you to get an implant, you could be missing a tooth or need something to help anchor a denture. When only one tooth is being replaced, Dr. Martin will place one implant in the area where the tooth is missing, and then restore it with an all porcelain crown. This is a great way to fix an area that is missing a tooth without affecting the surrounding teeth. Sometimes people come in with dentures that just don't fit their mouth. These patients are often carrying them in their pocket more than they are actually wearing them. For this procedure, your doctor would decide if you needed 2-4 implants per arch to help the denture "click" on and off to stabilize it. Once he has decided how many you need, he will refer you to another doctor to place the implants. If you do not have enough bone in the area: your doctor will need to place a bone graft to make enough surface area for the implant to be placed. This takes anywhere from 4-6 months for the bone to fully integrate before the implant can be placed. If there is enough bone in the area: your doctor is ready to place the implant. Once the implant is placed, it takes 4-6 months for the surrounding bone to fully integrate to the implant. After you are cleared by your doctor who placed your implant, you are then ready to head back to our office and begin restoring the tooth. How do you get a crown on your implant? The picture below will be referenced to help explain the process of placing a crown on your existing implant. Once the implant is cleared from the doctor who placed it, an impression of the teeth is taken for fabrication of a permanent crown. The impression is then sent off to a lab for the tooth to be made. The patient will be asked to return in 2 weeks to place a permanent abutment over the implant for the crown to be cemented to. 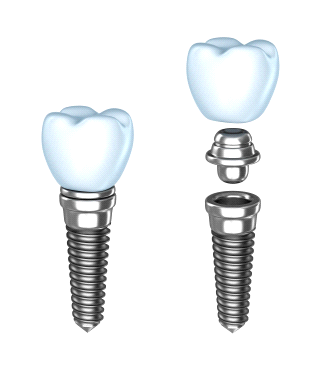 An abutment is a small piece that screws into the implant and acts as a post for the crown to be attached to. The last and final part to this puzzle is cementing the crown onto the permanent abutment. The only part that will be visible is the crown. Once the excess cement is removed from the surrounding tissue, Dr. Edwards will make sure it fits properly and you will leave the office with a tooth!